Draw, settle the pin, squeeze the release and 'THWAP!' The arrow appeared suspended momentarily on the far side of the big bull and then dropped into the dirt... all its energy expended getting through the animal. I was on the first day of my first hunting trip to the Republic of South Africa. I had traveled over with a group of 6 others from Central Texas with some of us making our first trip to Africa and others having been multiple times. I hoped to take several animals during our 5 days of hunting including warthog, impala, blesbok, black wildebeest, and kudu. We had seen most of them on our drive around the 30,000 hectare 'farm' as they call them in Africa and everybody was excited as we set out to the hides for the first time. I was guided by a native named Franz on the first hunt and even though language was a barrier, we understood each other, or so I thought. I hoped to capture my hunts on video and had shown Franz how to turn the camera on and press the record button first thing. What seemed like no time at all had passed when I looked out the window and there was a big kudu bull which had appeared from the brush as through my magic. The grey ghost earned his name! I motioned to get Franz to look out and gauge the bulls size and I could see his eyes get big and I knew it was a shooter! Even before he turned fully toward me and whispered urgently "GOOD BULL, GOOD BULL!! ", I had the release on the string and was preparing to draw. The bull paused about 12 yards away, perhaps sensing something was amiss. He stopped long enough for me to settle the pin right behind the shoulder. I don't remember releasing the arrow but it appeared on the other side and dropped into the dust. Instantly, the big bull started running straight away from us and just as he made the cover about 40 yards away, he stopped. I could just make out his hindquarters in the brush and watched intently for what seemed like hours but was probably no more than 5 minutes when he stepped out of sight. Now the REAL wait started! I knew it was a good shot even though I had been shooting uphill from our hide in the ground. We were waiting a while longer and then got out to follow the kudu into the brush. As we walked around the brush he had stopped behind, we found him laying just out of sight, down for good!! that had been put out. Bennett asked if I wanted the boar with the group and I shook my head. He was pretty nice but just didn’t excite me. They milled around for a while and I reconsidered as I looked at the length of the tusks the big boy had showing. I motioned to Bennett to get the camera ready and I turned to get my bow from the hook. I put the release in place and turned to the window... not a warthog in sight!! Back on the hook for the bow. I figured that if the bow gods were smiling on me, a bigger one was on the way. 10 minutes later a HUGE boar appeared out of the brush and made his way to the waterhole. Definitely a shooter!! He was facing directly away from me drinking for what seemed like forever. Finally he had his fill and moved to one of the supplement blocks placed at each waterhole. This put him in a perfect quartering away position. WHACK!! The arrow hit behind the shoulder and the big boar was gone in an instant! As he ran from sight, Bennett indicated we should go after him and we climbed out of the hide. The blood trail was easy to pick up and we slowly followed it, all the while scanning the brush for any signs of any of the dangerous game in the area. When there are rhinos and elephants around, it pays to keep on your toes!! We had gone less than 100 yards when we spotted the big boar in some heavy brush, flat on his side. It looked like the tracking was done. But, in the next moment, the boar spotted us and was up and gone in a flash! We listened as he tore through the brush, making a lot of noise. Back on the track. About 50 yards along, we came on him again and again he was laying in a small opening in more heavy brush. I was determined to put another arrow into the big warthog before he could get up and run again! We looked and looked but there was no place to put an arrow through the brush into the boar so I got down and slowly started crawling toward the small open spot he was laying in. I was within about 10 yards of the warthog before I could even get to my knees and draw. Just as I drew and anchored, he struggled to his feet and lunged away, following a trail. Fortunately, the trail led straight away from where I was kneeling so I put the pin in the appropriate spot on the departing warthog and released. CRASH!! The big boar hit the ground for the last time. I had been in Africa for two days and had my second trophy on the ground! The boar was going to look great on the wall along with the kudu!! Hunting Africa with a bow has to be very difficult. Great story. 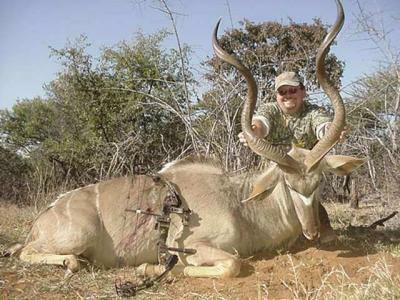 A very nice Kudu hunted with a bow. TWO GREAT ANIMALS WITH A BOW!! I AM ENVIOUS. IT MUST HAVE BEEN TERRIBLY EXCITING! !